Nigeria has reaffirmed its commitment to the international human rights law and international humanitarian law, which stipulate the protection of civilians in armed conflicts’ situations. The Permanent Representative of Nigeria to the UN, Prof. Tijjani Bande, made the pledge at the UN Security Council’s debate on the protection of civilians in armed conflict, including healthcare in conflict. 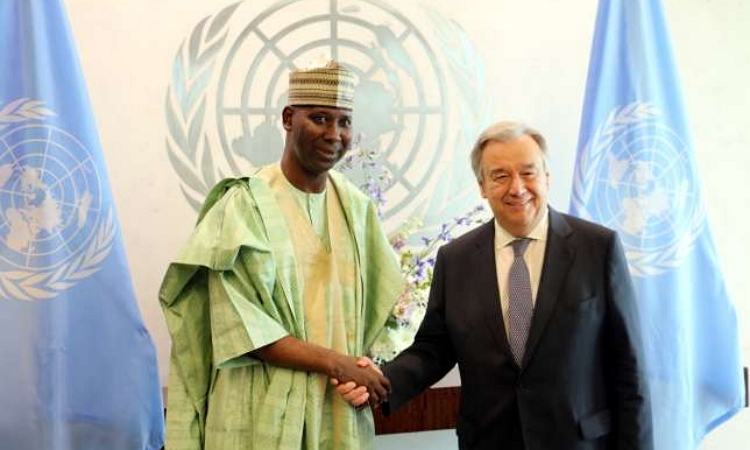 Bande said the Nigerian delegation commended the Presidency of Uruguay for organsing the debate and Secretary-General Antonio Guterres for his great insight and to other contributors for their perspectives. “Today’s debate is taking place at a time of great crisis in some parts of the world. “A time when attacks of humanitarian workers, have hindered the delivery of the much-needed medical assistance and supplies to millions of people in many theatres of conflict. “Health-care workers have been killed and injured, kidnapped and intimidated for carrying out their medical duties, and urgently needed medical supplies have routinely been blocked by protagonists. “Undoubtedly, the UN has a pivotal role to play in the protection of civilians in armed conflict and to prevent the emergence of situations of genocide, war crimes, ethnic cleansing and crimes against humanity. Bande acknowledged that existence of health facilities and activities of health workers were vital in saving lives and providing assistance to the wounded and sick in situations of armed conflict. According to him, health and other civilian personnel carry out their duties at great risk to their lives. He said they have been kidnapped, tortured and killed while performing their life-saving duties. He noted Resolution 2286 of former Secretary-General Ban Ki-moon, which recommended the swift implementation of this resolution, which platforms to enhance respect for the norms of international humanitarian law. “In fulfillment of its obligation, the Nigerian government has set up a Presidential Committee on North East Initiative to serve as the primary national body. “Among others, to enhance the security conditions in the northeast of the country, facilitate the work of health personnel and ease the movement of medical equipment and supplies. “We recognise and commend the assistance received from international partners and humanitarian agencies in the setting up of permanent and mobile health clinics, as well as support for infrastructure rehabilitation in affected communities. “Nigeria stands ready, as called for in resolution 2286, to join efforts with all concerned to protect civilians in armed conflicts. “Especially the prevention of acts of violence, attacks and threats against medical personnel and humanitarian personnel exclusively engaged in medical duties, their means of transport and equipment,” he said.